← Robert D. “Bob” Sodders Jr.
Marion R. (Kauffman) Pratt, 93, of Keene and formerly of Fairfield, CT. died on Saturday, March 3, 2018 at Langdon Place in Keene. She was born the daughter of the late Marion (Marsh) and the Rev. Henry Kauffman on August 9, 1924 in Bayonne, N.J. She was educated in Westwood, N.J. and graduated from Westwood High School. Marion went on in her studies and graduated from Montclair State Teachers College in New Jersey with a BA in French. 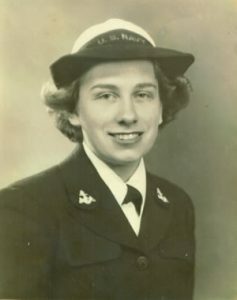 Marion was one of the greatest generation serving her country in the U.S. Navy during World War II where she served as a store keeper and translator. She was honorably discharged at the rank of Petty Officer 3rd. Class / E-4. She also worked as a Clinical Administrative Assistant for RCA International in New York City for several years after the war. Later in her career she was employed by Purdue Pharma Co. where she worked as an assistant credit manager. She retired in 1990. Marion enjoyed playing bridge, gardening, and playing golf. She also enjoyed looking at wildflowers in the woods and side of the road. Ms. Pratt is survived by her children; Judith M. Sullivan and her husband Francis of Keene, James Pratt of Pembroke, N.H., and her ex-husband, James D. Pratt of Newton, MA. She also leaves two grandchildren; Kathleen L. Sullivan of Albany, VT., Margaret M. Lashof-Sullivan and her husband Matthew of Watertown, MA. and a great granddaughter, Cora J. Lashof-Sullivan of Watertown, MA. Marion is pre-deceased by her brother John H. Kauffman.